With this data, nominal accumulated growth over the first three quarters of 2004 came to 4.7% in relation to the same period the year before. The retail trade sector of the A.C. of the Basque Country increased sales in the third quarter of 2004 by 6.6% with regard to the same period the year before, in nominal terms, according to Eustat data. This nominal increase becomes a 5.4% positive evolution in real terms. The evolution of sales in this sector over the first nine months of the current year reflects a 4.7% nominal increase in relation to the same period in 2003. In real terms, this accumulated increase over the first three quarters came to 3.7%. Retail trade in medium and large stores (non-specialised) grew 5.8% in the third quarter of the year in nominal terms. Once the effect of price rises is discounted, the variation in the inter-annual rate is 2.5% with regard to the same quarter the year before. Traditional retail trade (specialised) increased nominal sales by 7.0% in the third quarter of 2004 with regard to the same period in 2003. This nominal increase becomes 6.9% growth in real terms as a result of the evolution of prices. By Provinces, growth registered by nominal sales in the retail sector during the third quarter followed similar patterns in Alava and Gipuzkoa (5.0% in both cases), growing more in Bizkaia (7.9%). In real terms, increases registered in the provinces were quite similar in Alava (3.6%) and Gipuzkoa (3.8%), whereas in Bizkaia there was a 6.8% increase. 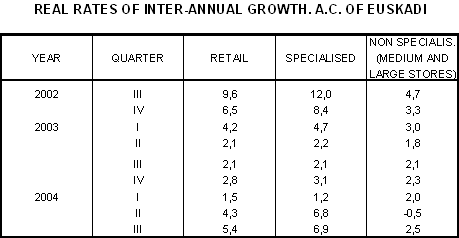 With regard to personnel employed in the retail trade sector in the third quarter of 2004, there was a -0.2% inter-annual decrease (with regard to the same quarter the year before) for the whole of the A.C. of the Basque Country and this is reflected on a provincial level as follows: a 0.5% decrease in Alava, a 0.3% fall in Gipuzkoa, while there was no variation in Bizkaia (0.0%).